Labels: Kitchen Sciences Posted by Yann_Chef on at 4:54 p.m. In this third article about sauces, I will look at the physical structure of a sauce: its consistency. As I wrote in my last post, a sauce is made of two basic things: flavour and texture. A great sauce is the perfect balance between the two. When it comes to consistency, several problems can arise, when making a sauce, that can make it unusable. It can congeal, curdle or separate, making your sauce either unpleasant to look at or feel in the mouth. Lets do a bit of chemistry. A sauce is mainly made of water, even cream ones. The only exceptions are butters and some vinaigrettes. The water or the fat in a sauce is defined by physicists as a continuous phase. It means that water is the material that bathe all the other components in the sauce. All these other components that swim in that continuous phase are called dispersed phase. So, giving a sauce some consistency is making that water based continuous phase feel less watery by adding a non-watery, dispersed phase into it. By doing that the free movement of the water molecules is obstructed, making the sauce feel thicker. To explain what is going on when we thicken a sauce, lets imagine a pot full of individual water molecules, H2O. 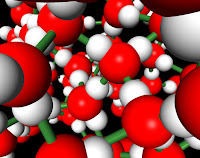 Left on their on, these water molecules have plenty of space to run around: they are very mobile. The water is runny and can flow easily. Now, lets add some flour (long chains of tangled molecules), some oil (droplets), tomato paste (particles) or some bubbles (air) into it. Give it a good stir. Bizarrely, our water seems less watery. The molecules in the dispersed phase that we added into the water are, now, taking some space in our pot. Our molecules of H2O have less space to run freely: we have reduced their mobility. Our liquid thickens. On a more poetic note, now. Depending on the thickening agent used, not only its consistency will vary, but its texture too. Fat (droplets) make the sauce feel creamier, air (bubbles) make it seem, some what lighter, flour (molecules) will make it sticky or slimy, fruit purée (particles) will make it smooth, etc. As you may have already noticed, there are 4 kinds of thickening agents: Particles, molecules, droplets and bubbles. Lets see how they interfere with our continuous phase. Thickening with particles consists of obstructing the continuous phase (water) with tiny bits of meat, vegetables, fruits, spices or seeds. It is what happens when making a tomato sauce or a salsa for example. When these foods are pulverized in the continuous phase all the cell walls and solid cells are broken apart and put in suspension in the water. Then, they obstruct and bind the water molecules, thickening the sauce. Such a mixture is called a suspension. Depending on the size of the particles the sauce consistency will vary and its texture will be more or less smooth. Note that suspensions have a tendency to settle and separate. Chefs will either increase the amount of dispersed phase by adding starch or reduce the continuous phase by straining the excess water. Thickening with molecules consists of dispersing single types of molecules, such as starch, gelatin, pectin in the continuous phase. Starch, pectin and gelatin molecules are like long tangled chains of smaller molecules. When dispersed in water, they spread their long chains away taking more space. In result, the water molecules are obstructed. Then the sauce thickens. If the sauce is left to cool down, undisturbed, these molecules can bond with each other and form a loose network that trap the liquid, immobilizing it. It is called: gelation process. Such a mixture is called a gel. If you make a béchamel and let it cool down without stirring it. It will form a semi-solid mass when totally cold. These types of thickened sauce are more stable that suspensions. They don't tend to separate as easily. Thickening with droplets is what happens when you do a vinaigrette. This is how it works. Has you all know water and oil don't really like each other, they do not mix. But if you whisk hard enough, the large droplets of oil that you can see floating away in the water are broken into tiny little ones that block the movement of the water. Such a mixture is called a emulsion. If you want to make a mayonnaise, for example you will require a third ingredient to stabilize the whole structure of your sauce. Such ingredients are called emulsifiers. These types of molecules have the property to attach themselves to water molecules on one end and to capture molecules of fat on the other end. The lecithin in the egg yolks of your mayonnaise are such molecules. Thickening with bubbles, in substance adding consistency with air. Very peculiar indeed. But this is what happen in the head of a beer or the foam on the top of a good espresso. If you scoop a bit of the head of a pint of Guinness, for example, it can hold its shape. 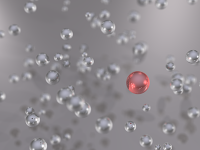 In a fluid, air bubbles behave, more or less, like solid particles. They disrupt the continuous phase that is water and obstruct its flow from one place to another. Such a mixture is called a foam. The major disadvantage of such sauces is that they don't support gravity to well. They are fragile and evanescent. 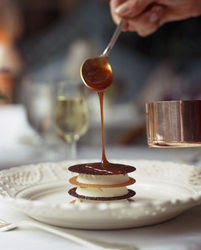 To delay the collapsing of such a structure, chefs thicken the liquid phase with substantial molecules or particles. It is the basic principle used to make a soufflé. In general, most sauces that chefs make, are combinations of thickening agents. Very few sauces are simple suspensions or foams. thanks so much for this educational post! it helps me to appreciate the chemistry behind sauce making better and thus making the sauce better! Thanks glad you liked. Must pay you a visit on food buzz.